Omni-channel innovation is about delivering customers what they want, not what the retailer wants, Nordstrom’s director of mobile customer application claims. Speaking at the Online Retailer and Ecommerce Expo in Sydney, Aaron Smith, shared how the retailer is combining digital and in-store capability with technology tools and a customer-centric culture to build seamless experiences across channels. Nordstrom’s technology team has doubled in size every year for the last three years and has a mandate and long-term view on making customer experiences as incredible as possible as digital investment ramps up. At present, ecommerce sales represent about 20 per cent of Nordstrom’s total sales, and the retailer is injecting millions into expanding its digital offerings. To ensure the customer is kept front and centre, the retailer has created an open workspace where user experience designers, engineers and other tech teams sit alongside business staff defining roadmaps. All use Agile and lean ways of working to make it easier to move quickly on new ideas, Smith said. In addition, Smith’s team has unstructured afternoons once a week to explore new technologies and how they may be valuable in the retail environment. These ideas are shared in weekly meetings. To further fuel collaboration, the company uses the GroupMe text-based app to create and manage project and social groups, and also pulls in customer tweets, app reviews and internal customer satisfaction scores to help staff stay close to what customers really think about experiences with the retailer. For Smith, innovation comes down to two things: Coming up with great new ideas; and refining those and moving quickly to get back to the customer and create something better. In today’s environment, innovation must also be driven by seamless experiences between the digital and physical world, he said. A service like click-and-collect, for example, is something only an omni-channel retailer can provide, Smith said. To ensure Nordstrom maximises omni-channel opportunities, a number of building blocks have been put in place. The first is a shared customer view. Historically, as bricks-and-mortar retailers moved beyond the physical store and into the digital realm, a lot of tech solutions were siloed, Smith said. “You’d shop on the Web but when you went to the mobile app, it wasn’t sharing the same information,” he said. “That made for a very clunky experience. So one big building block is creating a single customer view. The third is having a digital loyalty program, Smith said. Alongside physical discount ‘notes’ to customers, Nordstrom now has a digital offering where people can track these notes online or in the mobile app. The digital notes also feature a barcode and can be scanned directly from a phone while in-store. “From here, we can build experience on top,” Smith explained. “For example, we can combine loyalty program information with knowing where a product is located and a single view of the customer. So you can know if the store a customer is right near has any products that are in their shopping cart online, or if they have earned a note they can spend and that they’re right near a store right now. Nordstrom uses a ‘working backwards’ document to devise the customer vision and outcome before any initiative is started, Smith said. This involves the business writing an email based on what customers should be saying once they have a new service or capability in their hands, and why it makes their lives better. “It’s so easy to fall into the rut of doing what you want, but it’s much more powerful to look at what the customer wants and work back from there,” Smith said. 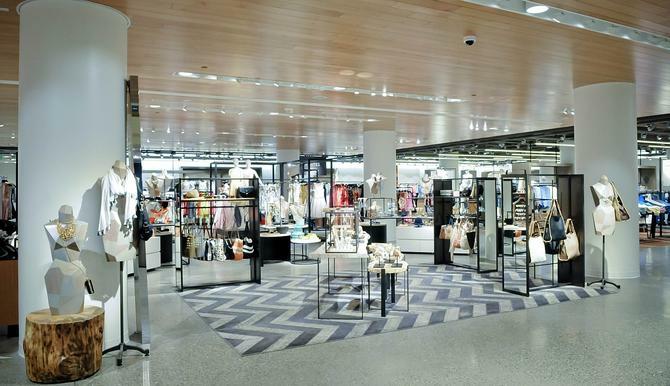 One evolving omni-channel customer initiative is Nordstrom’s mobile-based stylist offering. The idea stemmed from the fact that customers loved the advice and service provided by in-store sales staff and wanted to access that wherever and whenever they wanted, Smith said. In the first instance, the retailer launched a product called ‘Next’ (Nordstrom text), a secure solution that allowed a customer to build a relationship with sales person outside of the store using private text messaging. This involved customers using a normal text app at their end, but a special app created for sales staff. Smith said customers liked the idea, but found it wasn’t a great product sharing experience. “Staff were taking pictures of varying qualities for example, and there was friction in the purchasing process – while a customer trusted their sales contact and probably wanted that item, there was no way via texting of buying it,” he said. The next iteration, dubbed TextStyle, which launched in May across 116 US department stores, allows staff to scan an item, pull a professional picture with brief description of it, then also include a buying code into the private texts they send customers. By typing ‘buy’ and the code in their response, the sale is then charged to a customer’s credit card on file and shipped to their default shipping address. “The feedback so far is incredible, and it’s exciting for the team to be delivering something great for the customer and bringing them closer to the sales people they love,” Smith said. Read more Are you losing customers over poor digital experience?